Several datasets were put together using GIS and stored in a relational database. To date, about 320 datasets and reports, both digital and hard copy, have been generated using GIS. With GIS, DEAL is achieving its aims and has more than 5,000 registered users. The British Geological Survey (BGS) was founded in 1835 and is the world's longest- established national geological survey. Today, BGS is the national center for earth science information and expertise in the United Kingdom (UK) and has more than 30 years of experience providing geological and geophysical consulting services in hydrocarbon exploration and data management. Part of the BGS mission is to maintain a national archive of geological data for the public good and to provide access to a wide range of government, industry, and academic users. GIS-enabled Web site shows DEAL maps for wells, 2D and 3D seismic surveys, fields, coastlines, license blocks, international boundaries, pipelines, and other surface and subsurface hazards. To achieve this aim, BGS has developed its intranet and Internet facilities, including highly customized Web-mapping facilities. One of these applications, developed for Common Data Access Limited, a not-for-profit subsidiary of the United Kingdom Offshore Operators Association, is the Digital Energy Atlas and Library (DEAL) Web site. 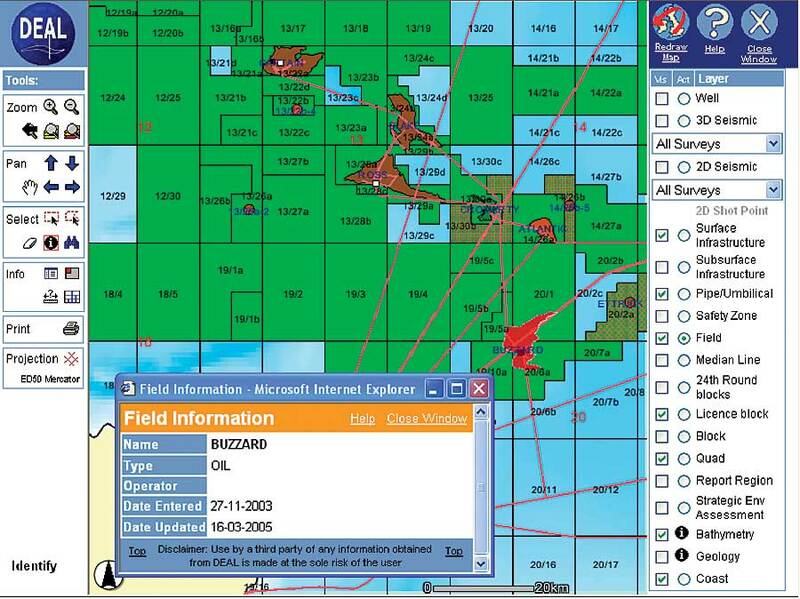 Initiated in 1999, DEAL is the result of a petroleum industry and government initiative to facilitate public and petroleum industry access to data relating to the United Kingdom Continental Shelf (UKCS). 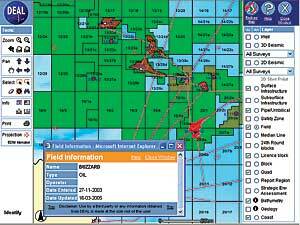 Within the UK, data relating to UKCS is collected by those searching for and producing oil and gas. This data is collected and stored by different organizations, in different formats, and on different media. For these reasons, prior to the creation of DEAL, it was generally difficult to find all relevant data products over a given area of interest on UKCS. The idea for DEAL came from a PILOT objective (joint industry and government), which suggested that a record of data be developed, maintained, and made publicly available through an Internet-based application. This application would allow a user to search for UKCS data and view details of whom to contact for further information on data of interest. BGS won the contract, with Esri as a partner, to develop the DEAL system using Esri technologies, including ArcIMS software, to enable data search via forms and/or a map interface. The main objective for DEAL is to meet the demand for quick and simple access to a single, complete, and reliable reference set of basic spatial and attribute data on UKCS. To achieve this aim, the following datasets were put together using ArcGIS Desktop software and stored in a relational database: wells, 2D and 3D seismic surveys, fields, coastlines, license blocks, international boundaries, pipelines, and surface and subsurface hazards. A customized ArcIMS map was then developed to which these datasets are served through ArcSDE. Over the past few years, the DEAL system, using GIS, has been expanded to include information about the hydrocarbons industry, infrastructure, and international code of practice to identify pipeline systems and free capacity to assist development of oil/gas resources. DEAL also continues to act as a regulatory repository for much of the offshore metadata, such as well and seismic survey headers. DEAL is now established as the definitive site for well and seismic metadata for UKCS. Since its launch in 2000, DEAL has been very successful in achieving its aims and now has more than 5,000 registered users with more than one million hits a month. The system is an excellent example of a joint government/industry initiative and won the Association for Geographic Information award for best practice in central government in 2001. This demonstrates the extent to which DEAL has become an essential petroleum industry tool in the UK, particularly for developing bids for licenses in each round of Department for Business, Enterprise and Regulatory Reform (BERR, formerly DTI) licensing. Although DEAL does not provide the functionality to download actual raw data, it does ensure that a record of data is maintained and accessible. In 2005, BERR asked BGS to extend the DEAL model to include information from the ongoing Strategic Environmental Assessment (SEA) project, which started in 1999 to assess the environmental implications of further licensing of UKCS. For the SEA project, UKCS has been divided into eight areas, with another three areas to be assessed for offshore wind-farm development (R2 areas). The project has so far generated around 320 datasets and reports, both digital and hard copy, and this process is continuing. These items have been created for BERR by a variety of organizations, including government-owned science laboratories, academic institutions, marine surveyors, and consultancies, and much of this information still resides with the organizations that produced them. BGS is currently gathering SEA data from the originating organizations and adding this data to the DEAL system in two phases. The first phase of this project was to add a map of the SEA areas to the DEAL system and provide the functionality to enable a user to download reports relating to each SEA area. This phase is complete, and the SEA reports are now available for download (or for request directly from BGS) through the DEAL Web site. Phase two of the project is to gather the other information collected during the SEA project, add these layers to the DEAL map, and include the functionality to download these raw datasets directly from the DEAL site. This information includes photographs and videos, as well as layers of geographic information in many formats. It has been estimated that at the end of the SEA project, around 650 documents totaling 1,100 gigabytes will have been collected, and it is intended that these datasets be stored and maintained by BGS for the foreseeable future and made freely available through the DEAL site. As BERR holds the intellectual property rights to these datasets, the data is provided at either no cost or low cost with no license restrictions; however, datasets supplied by BGS are subject to licensing agreements and provided at an appropriate cost. Adding the SEA data to the DEAL Web site and implementing the new functionality to download actual datasets and reports are exciting changes to the original DEAL system and data model. This new functionality is a significant move away from the original DEAL model, where the actual raw data was not available to download directly. Within the UK, geographic information and datasets collected from government organizations are not normally freely available to the public or industry. Adding the SEA data collected by BERR to the DEAL site and making it publicly available are major steps forward for data sharing and access in the UK, and it is hoped that this project will encourage further public and industry data sharing of this kind in the future. For more information, visit www.ukdeal.co.uk or contact Amelia Jane Pickering, GIS programmer/analyst, BGS (tel. : 44-31-6500423, e-mail: ajpi@bgs.ac.uk, Web: www.bgs.ac.uk).